Samsung's announcement of its i7110 candybar phone isn't the most exciting thing in the world... many people already knew of its presence thanks to the internet rumour mill. In fact, we even brought you all the specs and such earlier this month, as you'd expect from a site like TechRadar. You know we'll always be there for you. 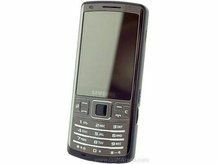 But for those among you who don't know, this is a candybar mid-to-high end phone, with a 5MP camera with LED flash, and an FM transmitter for playing your tunes on a radio. Its GPS functionality allows for geotagging of snaps, turn-by-turn directions for both walking and driving, and general 'where am I?' merriment. The walking directions are currently only available in 10 cities in western Europe, including London, Barcelona and Amsterdam, but more should be coming soon. It has a 1200mAh battery for up to 11 hours of talk time and media fun, which is more than adequate in this day and age. One of the most impressive features is the AMOLED screen, which is the best kind of OLED out there. It offers pin sharp graphics and clear, colourful images, so any snaps you take will look even better, even if they are just of you holding a cat. (By the way, if you're one of the people that show others these kind of snaps, please desist. Everyone knows nobody cares about photos unless they're in them). DivX and XviD support are packed inside the frame, as is 50MB of memory and a microSD card slot for expansion.